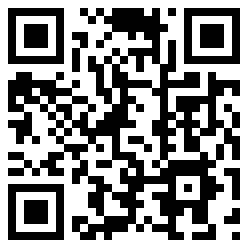 While my blogging has been few and far between during these first few months of 2013, I am still keeping up with what is going on in the world around me (my last post is proof of that continuing awareness) and in domestic political circles, too. 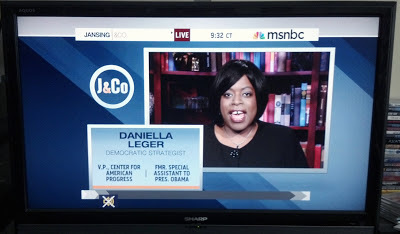 One of my "can't miss" television programs about politics, The Daily Rundown, airs every weekday morning on the MSNBC cable news channel. If you look through my postings over the past 15 months, I have blogged about it here several times already to offer my congratulations (and criticisms) when warranted. Unfortunately, this entry falls under the latter category. The graphic above is a display of some of my recent Twitter activity. 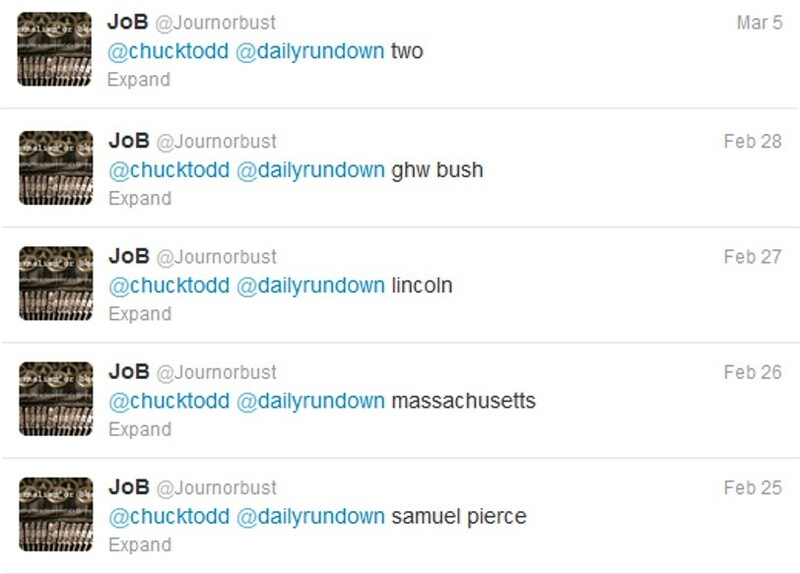 The common theme seen in that selection is the "mentions" or "at replies" to host Chuck Todd and the program itself (@chucktodd and @dailyrundown, respectively). On every show (even when Todd is away), a Daily Trivia contest is held right before the second commercial break to see who will be the first person to correctly answer the politically oriented question of the day. In order to be considered the winner, both "mentions"/"at replies" must be in the response in order for the answer to be accepted by their staff (according to Todd, this rule has disqualified a few submitters who had the first correct answers in the past). While some of the questions are pretty easy, others require some additional "brainpower" (or online research) in order to come up with the correct answer in an expedient manner. Trying to mentally recall recent electoral history just minutes removed from slumber and an hour or so prior to having my first dose of caffeine of the day, I immediately tweeted "Massachusetts" and waited for the answer to be given right before the commercial break midway through the "gaggle" portion of the show (approximately 10 minutes before the top of the hour). If I was a little more awake (or if I would've done some online research first), I might've changed my answer to Minnesota. In my haste to be first, I forgot that Massachusetts went for Reagan in 1984 while the "North Star State" voted for its favorite son, Walter Mondale, that same year (and was the only one out of the 50 to do that). 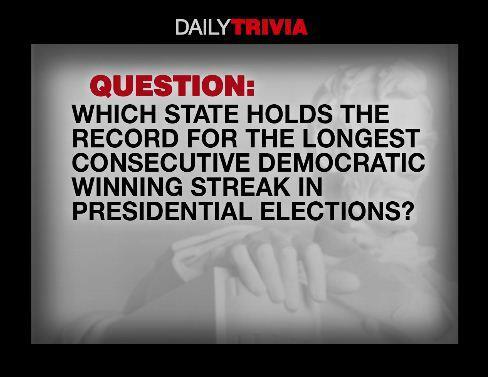 While its current 10-election streak (1976 through 2012) is the longest active streak, that total is exceeded by 11 Southern states that had been solidly Democratic for even longer periods of time during our country's history. Each had their own streaks of at least 11 consecutive cycles and Georgia, spanning from 1868 through 1960, holds the record at 23. To get this question correct, you had to remember that the country's political landscape between the end of the Civil War and the passage of the Civil Rights Act of 1964 was much different than it is today. During that near century span, Democrats dominated the states of the former Confederacy and those voters switched their party allegiances when African-Americans began receiving federal protections through that act and the Voting Rights Act in 1965. I didn't submit a guess but it apparently turned out to be a very difficult one to come up with. 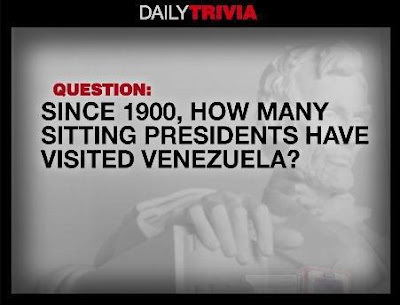 While Todd said that many responded with Pope Paul VI (who was the first pope to visit the United States in October 1965), the actual answer was Pope Pius IX. On August 1st, 1849, he boarded the USS Constitution which was docked just outside of Naples, Italy. Since a US warship is considered to be sovereign territory of the United States, Pius IX's three-hour stay aboard that craft was technically the first papal visit (and the correct response). 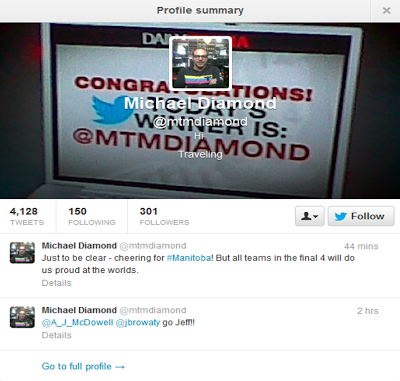 Instead of tripping over his unique handle, Todd used his real name (Michael Diamond) during his announcement and the only way he would've known what it was is that if he or a member of his staff went to the provided profile information. 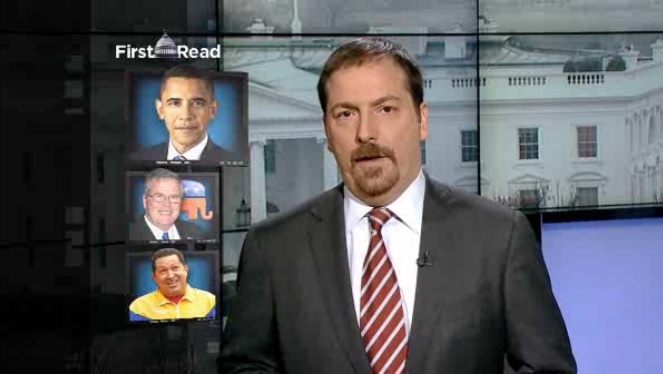 Since MSNBC cuts off their online clips at the point when those announcements are made, I cannot link to that specific one to prove my point but I clearly remember it happening that way. 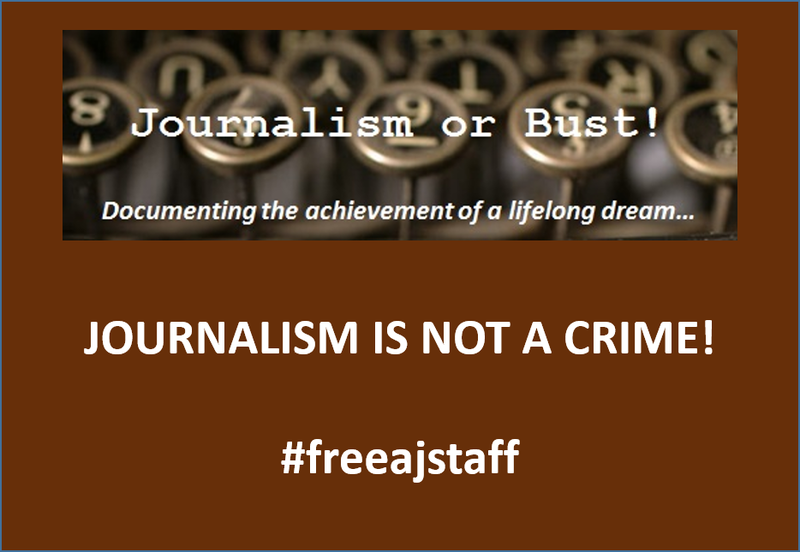 If he would've called me "Journ Or Bust", "Journalism or Bust" or even "JoB" (the formal name or sounded out phonetically, i.e., "Jay Oh Bee"), it would've been more preferable to what was actually uttered on Wednesday morning. 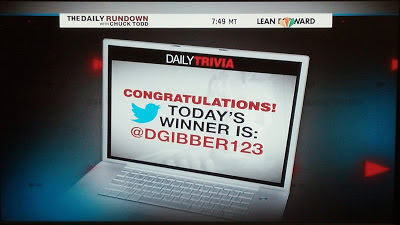 In the back of my mind, I was hoping that the staff would recognize their slight and perhaps slip my graphic in on the following day's show (much in the same manner as newspapers print corrections when they get things wrong). 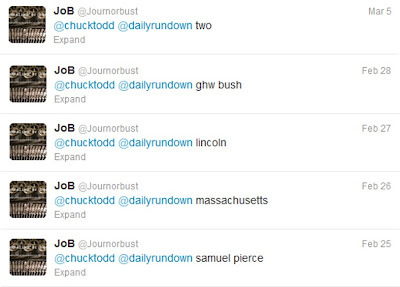 When that didn't happen, I shifted those hopes to Friday but those were quickly dashed when I saw Luke Russert guest-hosting for Todd (and he pretty much gave away the trivia answer when he blurted out "vacuum cleaner" on air to provide the audience a clue about which president was the first one born west of the Mississippi River--it was Herbert Hoover,). 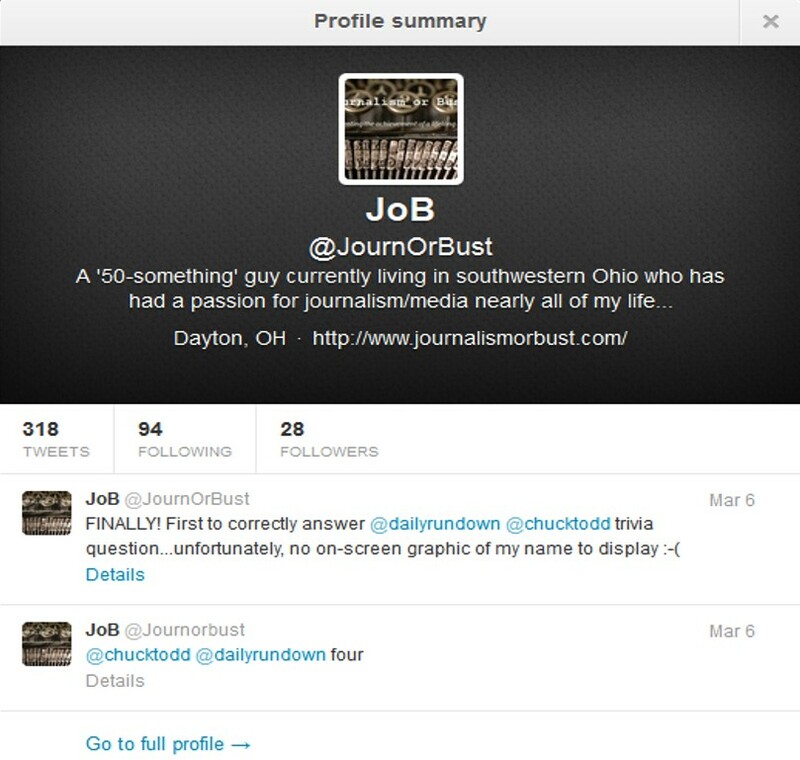 I could make a case for a deliberate personal snub by Todd or his producer. I cannot recall a single time--prior to Wednesday--when the Daily Trivia winner was not displayed as the question was answered so one can assume that they had their three-slide graphics scheme (the answer, the congratulations, and the soliciting for trivia questions) perfected. 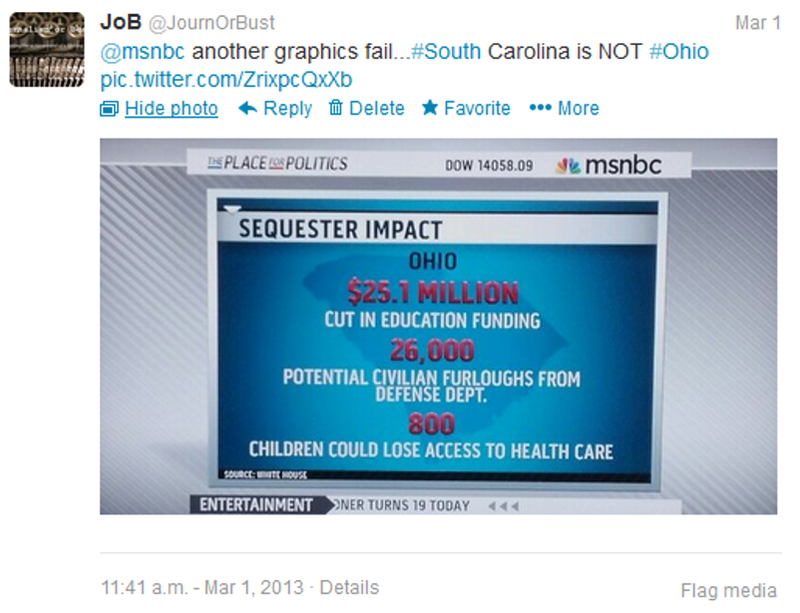 I did lay my criticism on thick late last year with the (mis)placement of Dayton on MSNBC-created maps. I did that because I was upset that my adopted hometown was being graphically disparaged and I wanted to let someone--anyone--know about it to help improve the news channel's overall credibility. I "tweeted" to people and program accounts that I believed would do the right thing and make those quick corrections but their track records can be rated "mixed" at best. To be fair, Wednesday was a very busy day (the Obama "charm offensive" with Republican politicians, follow-up to his Tuesday interview with Jeb Bush and the Chavez news) and bad weather in the Washington, DC area limited the "gaggle" to a single segment instead of its usual two. As someone who rigidly adheres to routines, I can personally attest that any change in my planned routine can cause minor "hiccups" in the overall flow. 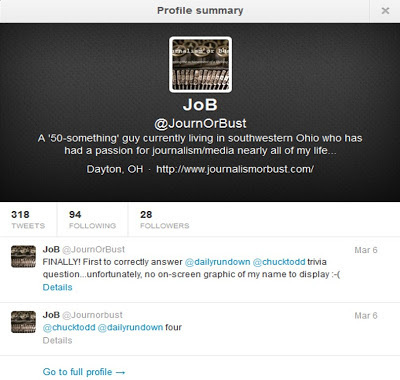 Even it this oversight was done for spiteful reasons, I still consider myself a loyal fan of Todd and The Daily Rundown. During my campaign-related events last year, I got to rub elbows with several "regulars" from the show. I met Politico's Jonathan Martin at the Romney rally in Beavercreek, The Washington Post's Dan Balz at the media sign-in table outside of the Obama campaign's kickoff rally, and The Grio.com's Perry Bacon Jr. at an Obama event in Cincinnati so, technically, I am within one degree of separation from Todd himself (and I could've met him in person at that Columbus rally last May if my online credentialing request wasn't missent to the volunteer coordinator instead of the press office). If I was so inclined, I would've run it through Photoshop to make it look as if it were an authentic photo capture off of the television screen. My video clip above is proof enough that I won Wednesday's contest so a PowerPoint recreation of what was omitted/forgotten will have to do. Uunfortunately, based upon my past experience with that specific news channel and their on-air graphics, that level of mediocrity happens to be a standard that MSNBC someday aspires to achieve. UPDATE (March 15): on today's program, two members of the NBC Universal graphics department were "selected" to give the show's "Good Morning" video introduction. Stephanie Hasiotis and Andrew Dobish (hope I got those right considering they were on a graphic posted on that news channel) are out of the New York headquarters and shot the clip inside the "MSNBC graphics control room". After their clip ended, Todd referred to them as "our friends that we drive crazy in graphics" and, considering what I have posted here on several occasions, they apparently take those misdirected frustrations out on me and other viewers on a regular basis. 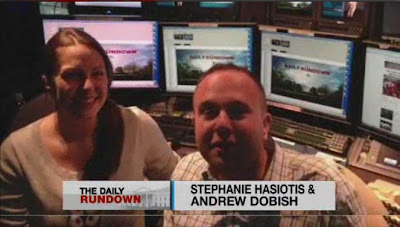 Since Ms. Hasiotis lists "social media manager" as one of her current responsibilities (not at her primary employer but for a holiday gift retailer) and Mr. Dobish has his own Twitter account, I will have to start including them both on any future "tweets" about graphics-related issues so that somebody at MSNBC might actually review them.